All three values are important, but this time, we paid most attention to SIMPLICITY=USABILITY. When you open DocLogix 2014 you will find improvements in every step: Registration, resolution management, control and monitoring, search, e-signing, contact management, compatibility and much more. Please meet DocLogix 2014 – MORE SIMPLICITY AND EVEN BETTER PERFORMANCE for your daily work. Have you ever estimated how many documents you register per day, week or month? We have investigated that depending on the type of company and IT infrastructure it has, the registration of a document could take from 2-3 minutes. 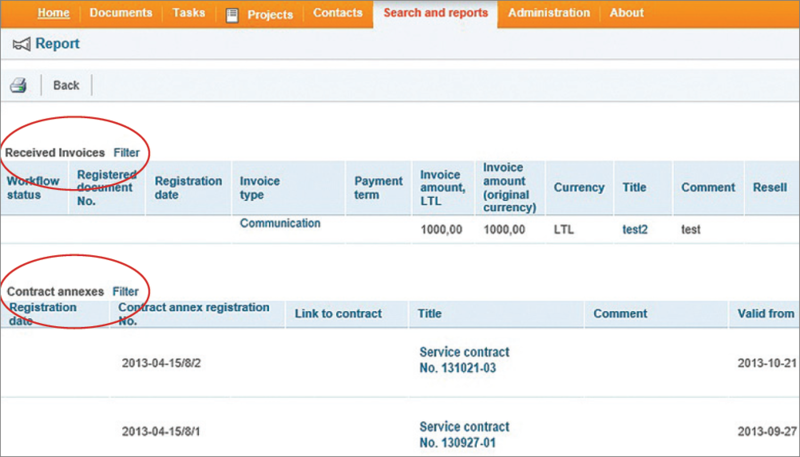 Now, DocLogix 2014 enables document registration in just 30 seconds. Seconds multiplied by thousands convert into saved hours and days. Favorites will be provided as you start filling the document card, so your typing efforts will be reduced. For your convenience multiple file upload is available from all most popular internet browsers. In order to save your time, the system may delete original files automatically, once they have been converted into PDF. Start the document related process automatically when creating a document. Let’s calculate: if an organization registers more than a thousand documents per month, it used to take 4.2 days of one man’s full time just to register those documents. With DocLogix 2014 it will only take 1 day. The company saves 3.2 day per month! Little things solve huge problems. No more confusion related to responsibilities. Assign and manage the same or several resolutions to multiple employees at once. We strongly recommend using specific type of DocLogix tasks for resolutions management. Although task based resolution functionality was very well accepted, it used to be a little bit tricky when there was a need to manage several resolutions for one document or identify the main responsible person when several employees were assigned to the same resolution. With DocLogix 2014 these situations are handled. With DocLogix 2014 the visualization of resolution history was improved. From now, you may assign the main responsible person for the resolution. Deadlines are for meeting them. Have you ever found yourself in a situation when somebody’s missed deadlines influence the final result? For instance: if your business trip expenses are not approved on time you will not receive compensation or it will be late. So, DocLogix 2014 introduces automatic task completion functionality. It is irreplaceable for avoiding process delays when somebody lags behind fitting in settled terms for task completion. A responsible person will receive a task with special notifications about task’s due date and possible system actions in case a task is not completed on time. If deadline is missed, the auto completion functionality turns on and the system completes the task and processes the document further. Note: ask your system administrator or local DocLogix partner to enable these capabilities and configure them in accordance with your internal document management procedures. All employees are automatically acquainted with valid rules and procedures relevant to their position. Has a new employee enrolled into the company again or changed the position? Have rules and instructions been changed or expired? It is a common situation, when a person, responsible for human resources, must track if all employees have been acquainted with their rules and instructions, whether they have been signed and whether they are still relevant. Tracking and managing these situations is a complex task. 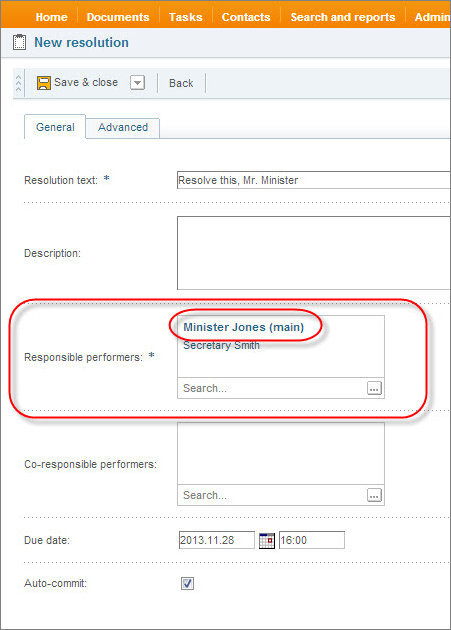 From now, DocLogix 2014 will automatically send relevant rules to new employees for acquaintance as well as notify existing employees of any changes. 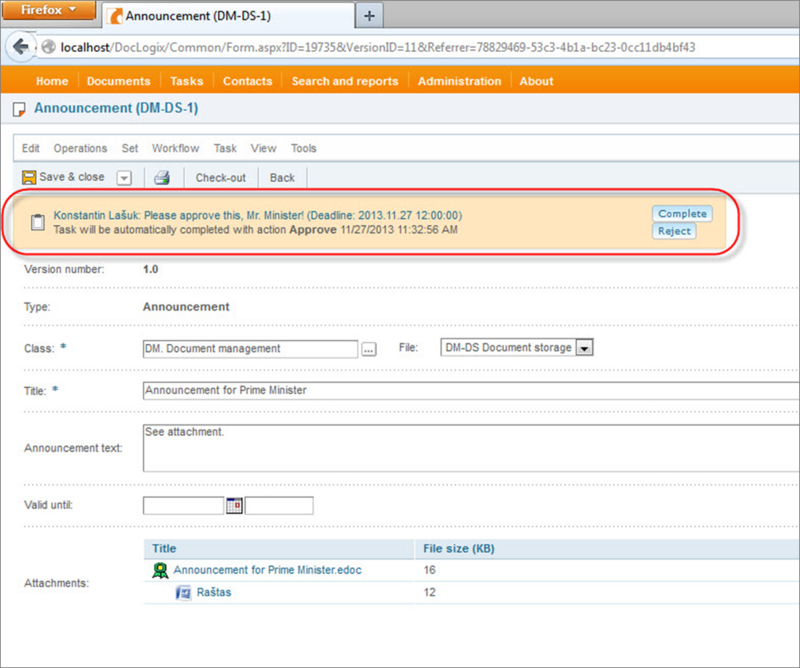 Track when a new employee enters the organization and will send all rules and instructions for acquaintance automatically. 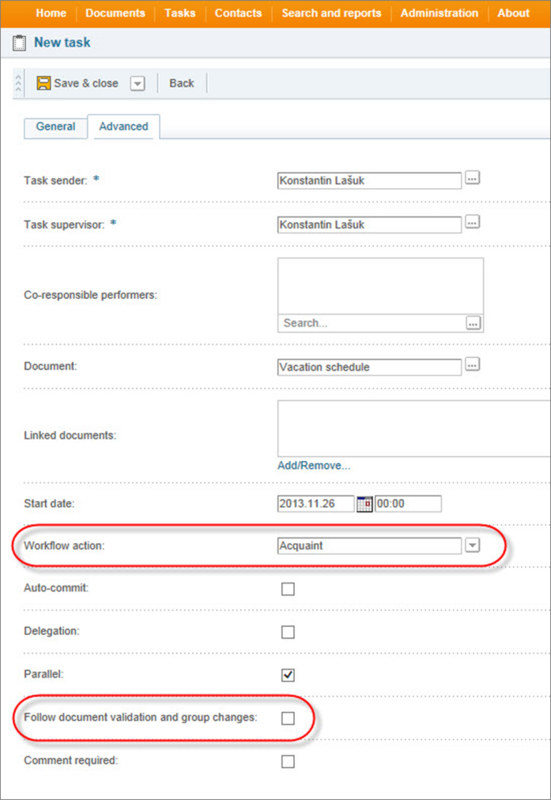 Track when employee changes position within a company, and will send additional rules (if needed) for acquaintance. Track if someone did not confirm that he has acquainted with the rules or instructions and will inform the person responsible for HR and the employee himself/herself. In DocLogix 2014 Simplicity concept has been applied to single field search. Our customers asked for search optimization. 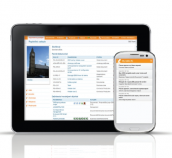 And here it is – quicker search engine with more relevant and structured search results. 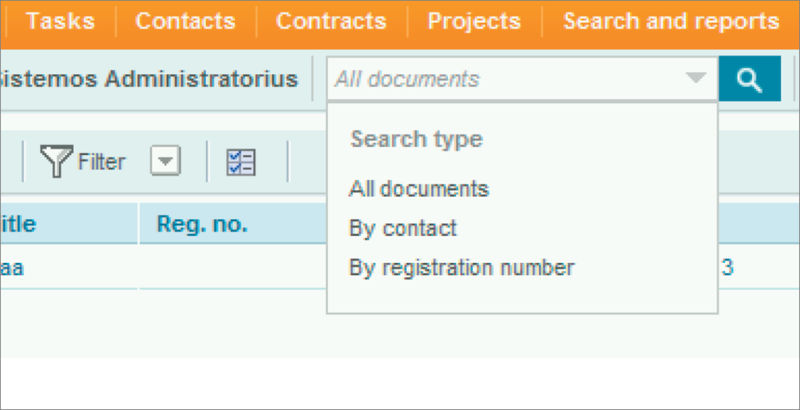 With DocLogix 2014 you will be able to find all documents related to your customer, partner, particular registration number. This is possible straight from the single search field quickly and easy. In just two clicks you will receive a detailed search report, where documents are grouped according to the document types. All documents are presented in accordance with the strict security rules. This function is available without any configuration. Security: as usual, every employee can only access only the information that is allowed according to company security policy. More and more people tend to work in more than one position. Just imagine you have an employee (or you are the one) who works for one or several organizations in different roles. Sounds confusing? You might work with different types of documents, different teams, belong to different groups, and take part in different business and document management processes. The situation becomes even more complicated once the security question is brought about. DocLogix 2014 recognizes the user and provides his particular DocLogix working desktop depending on his chosen role. To assign the same user to different groups and apply different security settings depending on his positions at the company. Change your working desktop according to your position in one click. Access different documents, receive tasks and be involved in different processes depending on your chosen position. New functionality may serve as a user versioning function. It is commonly needed when a user gets married and changes his/her last name. A person with changed last name starts DocLogix as a new user. Note: Ask your system administrator to configure this functionality. Complete several tasks to sign documents at once. E-signature is becoming a common practice at DocLogix customer companies. 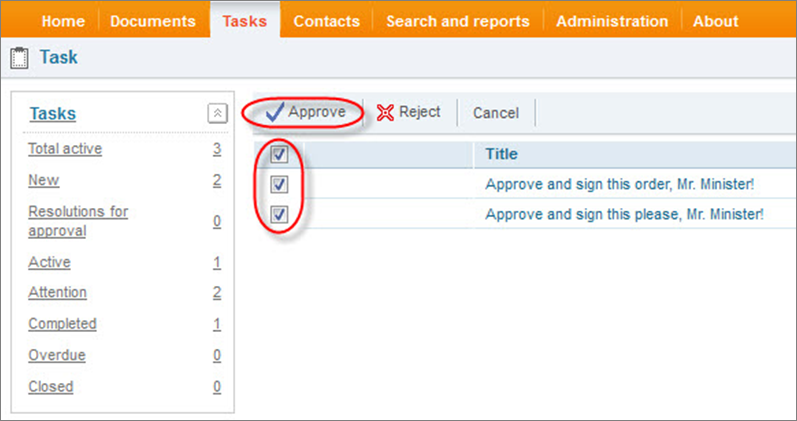 Multi-signing functionality was introduced in the earliest DocLogix versions. But with DocLogix 2014 we have made a major improvement. For your convenience DocLogix 2014 allows you to complete multiple tasks that require a digital signature. Let your organization grow without any limits. You should not worry about increasing number of employees or documents in your organization. From now, both DocLogix database and WEB application server are compatible with x64 architecture. When used on a 64 bit machine DocLogix 2014 can now use terabytes of operating memory and, as the load increases, the system can be scaled and its performance kept in check by just adding some relatively cheap hardware.